The Czech Republic, Hungary, Poland and Slovakia have joined together to promote tourism to the four Central European sovereign states, to overseas visitors. The promotional name for this joint marketing initiative by the national tourism head offices, is the European Quartet. The Quartet, otherwise known as the Visegrad Four (V4), has been working together to ensure long-term success in fields of common interest, through continued and reinforced internal co-operation. The Visegrad initiative is an expression of the effort to develop the region of Central Europe within the wider framework of Europe-wide integration. All four countries share both historical roots and cultural traditions. At the same time however, each of the member countries has its own unique identity, be this in the field of architecture, art, religion, folklore and traditions or landscape. It is because of these unique characteristics that visitors to the V4 region are surprised to find new and intriguing surprises at every step of their journey and are most certainly not bored. The Visegrad area offers several unique UNESCO monuments, world famous spas, authentically preserved historical towns and places of stunning natural beauty. “European Quartet” is the promotional name for joint marketing of the national tourist head offices of four Central European sovereign states – the Czech Republic, Hungary, Poland and Slovakia, under which they present themselves in the field of tourism. 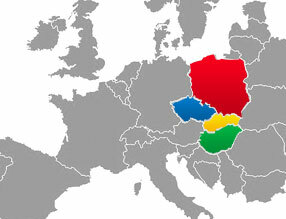 The association of these countries, known as the Visegrad Four (V4), has actively been developing cooperation over the long term in fields of common interest and is intensively reinforcing its internal cooperation. The Visegrad initiative is an expression of the effort to develop the region of Central Europe within the wider framework of Europe-wide integration. This is based on the joint historical roots or one civilisation which all four countries belong to, on a shared cultural tradition and similar historical development. At the same time however, each of the member countries has its own unique points and specifics, be these in the field of architecture, art, religion, folklore and traditions or nature. Thanks to this, visitors to the V4 region are surprised every step of the way and are most certainly not bored. The Visegrad area offers several unique UNESCO monuments, world famous spas, authentically preserved historical towns and places of natural beauty.